9mm SMAW | MAST TECHNOLOGY INC.
History: Customers: LAP of USMC Spotting Cartridge for Naval Surface Weapon Command-Dahlgren Division and the Army’s Operational Support Command-Rock Island, IL. MAST has also produced for Primer contractors like General Dynamics, CMS Defense, and Talley Defense. Description: This round is part of the Shoulder Mounted Assault Weapon (SMAW) an 83mm rocket family. The cartridge is designed to match the trajectory of the rocket and is used to sight-in the rocket. The cartridge is a 9mm rifle cartridge with a High/Low system to have the cartridge arc more like the rocket path. The rocket has a long and distinguished career with the USMC and overseas before it was brought over to the US. It was originally known as the Israeli B-300. One of the system’s many nicknames is, “the bunker buster,” and it does quite well against armor and other fortifications. 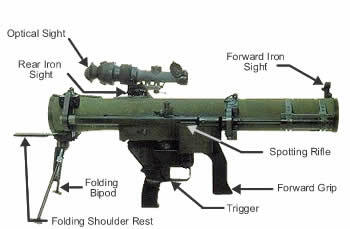 The Army chose to use the single-use SMAW-D for disposable, where the standard SMAW required a two-man team (a gunner with a round in the launcher and a second man to carry three extra rockets). Jim Bell was involved in the ‘Americanization’ program with McDonald-Douglass in the mid 1980′s. The TDP is still in metric.